Couple of cool things to note. First off, you’ll see a QR code next to the camper’s name. This will link to the camper’s profile page of the Great Lakes THATCamp website. We’ll have a post detailing the ins and outs of QR codes in the near future. Second, you’ll notice “Local” in the bottom right hand corner of the badge. Anyone who is a local will get this on their badge. The idea is that they will be able to help out by offering up local information to those who are from out of town – where is the best place to get a drink, how do you get back to the hotel, that kind of thing. ADDENDUM: The QR code in this comp was actually just a test. We’re most likely going to use a QR code with a little more complexity – name, institutional affiliation, email address, website, etc. 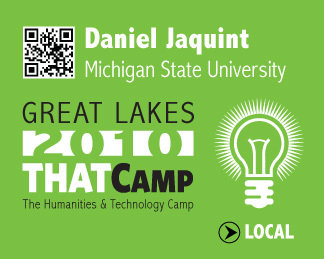 This means that in order for all of the relevant info to show up in the QR code, campers should update their profile (which you originally created when you applied for Great Lakes THATCamp).